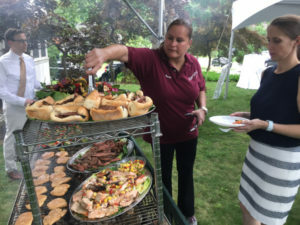 Turn your next party into a smashing success with one of our Barbecue options: Backyard Barbecue Buffet, Bob’s Barbecue Blast, Louisiana Clam Bake, Texas Feast or Totally Vegetarian. Grilled Teriyaki Chicken, Burgers and Sabrette Franks with buns, Corn on the Cob, Pasta Salad, Fresh Tomato and Cucumber Salad, Tossed Garden Salad with dressing, Nacho Chips with Salsa, and a Condiment Buffet consisting of Lettuce, Tomatoes, Cheese, Onions, Pickles, Olives, Ketchup, Mustard, Relish,and Sauerkraut, and Watermelon for dessert. 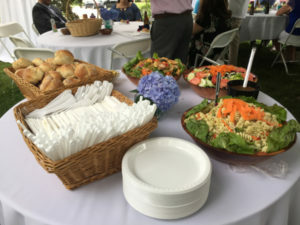 Prices are for catering of 50 people or more. 75 minimum for Saturday’s in May and June. Please call us for prices of less than 50 people. Crew charge is based on 35.00 per hour per crew member plus 15% gratuity. The duration of most parties is about 4 hours. 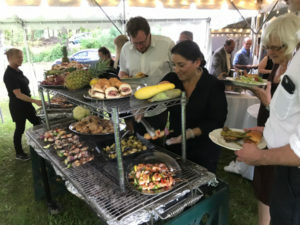 Grill hardware (grill and buffet tables) are provided by Cartwright Party Rentals. You will be billed for this separately. Gersky’s will be glad to make special arrangements for you that include tents, tables, chairs, and entertainment. If you don’t have a backyard or your backyard isn’t large enough, we’ll be happy to recommend several alternative locations. 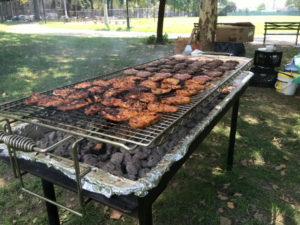 Many other options are available to enhance your barbecue experience.